La clasificación de la enfermedad renal crónica (ERC) realizada en 2002 por el grupo Kidney Disease Outcome Quality Initiative en 5 estadios con base en la tasa de filtración glomerular ha permitido estandarizar los parámetros de diagnóstico y ha sido de gran utilidad para el ejercicio de la práctica clínica, la realización de múltiples estudios de investigación, así como el desarrollo de políticas de salud pública a nivel mundial. Publicaciones posteriores han propuesto diferenciar la presencia de enfermedad renal en riñón nativo o trasplantado y subdividir el estadio 3 en A y B por ser un rango muy amplio en donde ocurren eventos muy importantes, sobre todo a nivel cardiovascular. Por su parte, las guías de práctica clínica Kidney Disease Improving Global Outcomes sustentan la proteinuria-albuminuria como factor pronóstico indiscutible de la ERC. A su vez, con respecto a la hipertensión arterial crónica, aunque no alcanza valor estadístico significativo como factor de riesgo independiente para la progresión de la ERC, la mayoría de los análisis evidencian que el control adecuado de la presión arterial es benéfico y retarda la progresión de la ERC en pacientes con proteinuria; tanto es así que es considerada como la segunda causa de ERC después de la diabetes mellitus, por delante de las glomerulonefritis. Con base en lo anterior y teniendo en cuenta que una enfermedad multifactorial como esta no puede ser evaluada con tan solo uno de los 3 principales factores de riesgo que más determinan su evolución, proponemos una nueva, práctica y fácil manera de clasificar la ERC tomando simultáneamente las 3 variables antes mencionadas, logrando un concepto más integral de la enfermedad. 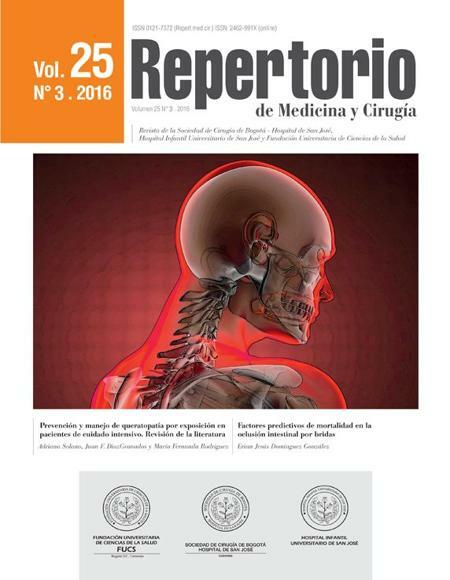 Este método diagnóstico, además de identificar la enfermedad, puede ser útil para determinar la severidad y predecir su riesgo de progresión. De igual manera, al tener parámetros cuantificables, puede servir como instrumento de seguimiento prospectivo de las intervenciones terapéuticas que se realicen. 1. National Kidney Foundation. K/DOQI clinical practice guidelines for chronic kidney disease: Evaluation, classification, and stratification. Am J Kidney Dis. 2002;39 2 Suppl 1:S1–266. 2. Andrassy KM. Comments on ‘KDIGO 2012 Clinical Practice Guideline for the Evaluation and Management of Chronic Kidney Disease’. Kidney Int. 2013;84:622–3. 3. Bauer C, Melamed ML, Hostetter TH. Staging of chronic kidney disease: Time for a course correction. J Am Soc Nephrol. 2008;19:844–6. 4. Cockcroft DW, Gault MH. Prediction of creatinine clearance from serum creatinine. Nephron. 1976;16:31–41. 5. Levey AS, Bosch JP, Lewis JB, Greene T, Rogers N, Roth D. A more accurate method to estimate glomerular filtration rate from serum creatinine: A new prediction equation. Modification of Diet in Renal Disease Study Group. Ann Intern Med. 1999;130:461–70. 6. Levey AS, Stevens LA, Schmid CH, Zhang YL, Castro AF 3rd, Feldman HI, et al. A new equation to estimate glomerular filtration rate. Ann Intern Med. 2009;150:604–12. 7. Stevens LA, Coresh J, Feldman HI, Greene T, Lash JP, Nelson RG, et al. Evaluation of the modification of diet in renal disease study equation in a large diverse population. J Am Soc Nephrol. 2007;18:2749–57. 8. Michels WM, Grootendorst DC, Verduijn M, Elliott EG, Dekker FW, Krediet RT. Performance of the Cockcroft-Gault, MDRD, and new CKD-EPI formulas in relation to GFR, age, and body size. Clin J Am Soc Nephrol. 2010;5:1003–9. 9. Shlipak MG, Katz R, Sarnak MJ, Fried LF, Newman AB, Stehman-Breen C, et al. Cystatin C and prognosis for cardiovascular and kidney outcomes in elderly persons without chronic kidney disease. Ann Intern Med. 2006;145:237–46. 10. Brantsma AH, Bakker SJ, Hillege HL, de Zeeuw D, de Jong PE, Gansevoort RT. Cardiovascular and renal outcome in subjects with K/DOQI stage 1-3 chronic kidney disease: The importance of urinary albumin excretion. Nephrol Dial Transplant. 2008;23:3851–8. 11. Hallan SI, Ritz E, Lydersen S, Romundstad S, Kvenild K, Orth SR. Combining GFR and albuminuria to classify CKD improves prediction of ESRD. J Am Soc Nephrol. 2009;20:1069–77. 12. Warnock DG, Muntner P, McCullough PA, Zhang X, McClure LA, Zakai N, et al. Kidney function, albuminuria, and all-cause mortality in the REGARDS (Reasons for Geographic and Racial Differences in Stroke) study. Am J Kidney Dis. 2010;56:861–71. 13. Burgos-Calderon R, Depine S. Systematic approach for the management of chronic kidney disease: Moving beyond chronic kidney disease classification. Curr Opin Nephrol Hypertens. 2010;19:208–13. 14. Hemmelgarn BR, Manns BJ, Lloyd A, James MT, Klarenbach S, Quinn RR, et al. Relation between kidney function, proteinuria, and adverse outcomes. JAMA. 2010;303:423–9. 15. Gu Q, Dillon CF, Burt VL, Gillum RF. Association of hypertension treatment and control with all-cause and cardiovascular disease mortality among US adults with hypertension. Am J Hypertens. 2010;23:38–45. 16. Chen J. Epidemiology of hypertension and chronic kidney disease in China. Curr Opin Nephrol Hypertens. 2010;19:278–82. 17. Appel LJ, Wright JT Jr, Greene T, Agodoa LY, Astor BC, Bakris GL, et al. Intensive blood-pressure control in hypertensive chronic kidney disease. N Engl J Med. 2010;363:918–29. 18. James PA, Oparil S, Carter BL, Cushman WC, Dennison-Himmelfarb C, Handler J, et al. 2014 evidence-based guideline for the management of high blood pressure in adults: Report from the panel members appointed to the Eighth Joint National Committee (JNC 8). JAMA. 2014;311:507–20. 19. Comments on the ESC/ESH guidelines for the management of arterial hypertension 2013. A report of the Task Force of the Clinical Practice Guidelines Committee of the Spanish Society of Cardiology. Rev Esp Cardiol (Engl Ed). 2013;66:842–7. 20. Wen CP, Cheng TY, Tsai MK, Chang YC, Chan HT, Tsai SP, et al. All-cause mortality attributable to chronic kidney disease: A prospective cohort study based on 462 293 adults in Taiwan. Lancet. 2008;371:2173–82. 21. Gansevoort RT, de Jong PE. Challenges for the present CKD classification system. Curr Opin Nephrol Hypertens. 2010;19:308–14. 22. Levey AS, Eckardt KU, Tsukamoto Y, Levin A, Coresh J, Rossert J, et al. Definition and classification of chronic kidney disease: A position statement from Kidney Disease: Improving Global Outcomes (KDIGO). Kidney Int. 2005;67:2089–100. 23. Hogan M. KDIGO conference proposes changes to CKD classification, but not to the definition. Nephrology Times. 2009;2:9–10. 24. Levey AS, Stevens LA, Coresh J. Conceptual model of CKD: Applications and implications. Am J Kidney Dis. 2009;53 3 Suppl 3:S4–16. 25. Hallan SI, Stevens P. Screening for chronic kidney disease: Which strategy? J Nephrol. 2010;23:147–55.